Does high altitude make your car lose power? Thousands of people travel towards the hill stations such as Murree, Nathia Gali and Ayubia during holidays or other seasonal vacations. 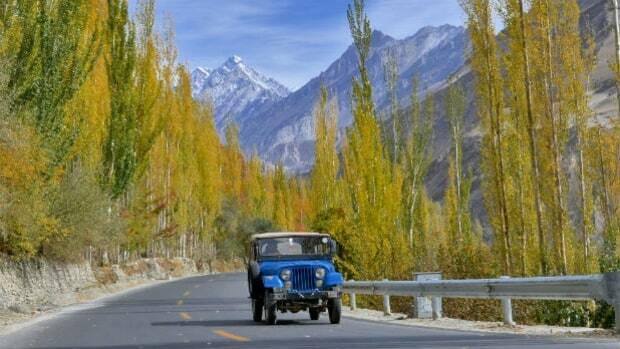 Apart from this many people also travel towards the Northern areas like Swat, Hunza, Naran and Kaghan. If we talk about Murree, it is approximately 7,517 feet about the sea level. There are many other tourist spots as well such as Hanna Lake which is approximately 6,247 feet above sea level and Lake Saiful Muluk which is 10,577 feet above sea level. Hence, we can say there are many tourists spots in our country which are thousands of feet above the sea level. Since we are talking about aforementioned tourist spots which are thousands of feet above sea level, it is worthy to mention here that vehicle loses power at a higher altitude which is one of the common problem faced by the commuters. And if you face a natural phenomenon like snow, rain or even landslide then you can get yourself stranded easily for hours. The situation like these makes people think that their vehicle isn’t working properly due to them but the truth isn’t like this. There is a science which is simple to understand why our vehicle loses its power at a high altitude. We know that in order to make a combustible charge, the car needs the fuel mixed with air. The charge is basically a mixture of fuel and air. Hence, we get terms such as superchargers and turbochargers. There are spark plugs in the cars which run on petrol which is used to ignite that charge. The piston is pushed downwards when the charge is combust on the ignition. A cycle rotating the crank is obtained when the continuous combustion of fuel and air is mixed and in return, torque is obtained from the engine which is then transferred to the transmission. However, there is no need of spark plugs in the cars that run on diesel because the mixture combusts itself under pressure due to the high compression of diesel itself. The air is quite thin at a higher altitude which means that there is less oxygen there. And that is the very reason why you lose breath quickly or even feel trouble while breathing properly as you are moving up in the hills or mountains. The air will keep getting thinner. The higher you go from sea level. You all must also have known about the phenomenon that in order to light a fire, oxygen is needed and without oxygen, there is no fire. Therefore, keeping in view this phenomenon, in thinner air you will be having a weaker charge i.e air+fuel mixture. This weaker charge will affect your vehicle in a way that vehicle won’t be able to perform at optimum level because the charge isn’t sufficient. In simple words, in order to burn the fuel inside the car, oxygen is needed. When there is less oxygen, the fuel won’t be able to burn at an optimum level which in turn won’t be able to produce enough strong bang to push the piston with force. For the very reason, 660cc cars or cars like Suzuki Mehran have a hard time going up there because of their naturally aspirated engine. People often make mistake in such situation by misusing the clutch which in turn burn the clutch plates. Because at higher altitude, drivers often end up using the excessive clutch to climb without stopping because the car isn’t producing enough power. This excessive use of clutch just simply decreases the lifespan of the clutch. Depending on how high you are from the sea level, this power drop in your vehicle can be serious. Let’s say if a car normally is making 500BHP at sea level then its power may be decreased to half of the level if you are around 10,000 feet above sea level. Around the globe, people agree that around 4% of the power of car kept on decreasing with every 1000 feet above the ground as per the rule of thumb. Therefore, keep in mind that you’ll lose around 40% of your actual power if you are 10,000 feet above sea level. Therefore, in order to improve the efficiency of your vehicle especially car at higher altitude, you must slap a supercharger or turbo on it whatever is suitable for your car. However, the turbocharger would be more efficient as compared to the supercharger in such cases. The cars which are aspirated naturally are affected badly when the air decrease at high elevation. But the supercharger and turbocharger both are forms of forced induction. By doing this you are basically adding extra air in the engine which in turn cause the ECU of the car to adjust the fuel in it accordingly thus allowing a bigger charge in the cylinder to ignite. This bigger charge means that more power is obtained. There forced induction will help the vehicle by keeping the sufficient air in the engine for combustion when you are either at 8000 or 10,000 feet above sea level. Do you think your car engine is clean? At higher altitudes air density is lower which means low number Oxygen molecules . Low air density disturbs the air fuel mixture but that could be unnoticeable in newer engines, which can change the air fuel ratio according to number of oxygen molecules in exhaust gases. Went to Babusar Top in my '12 City. Didn't experience any power loss or lugging. Maybe higher than 15000ft might cause power loss issues.